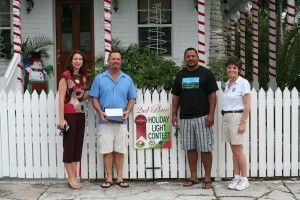 We thought we would share with you the winners of the Holiday Light Contest. These folks worked to hard on their houses not to go recognized. 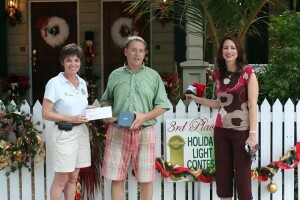 First prize and an award of $500 went to Robert and Fran Decker at 600 Elizabeth Street. Second Place and the winner of $300 went to Stephen Habberstad of 302 Amelia and third place and the winner of $200 went to Stephen Hammond and Jonathon Beyers of 909 United Street. On hand to make the presentation were Lind Test, Director of Key West Operations for Historic Tour of America and Lynn Tejeda, Executive Director of Keys Energy Services. Congratulations to everyone who entered and participated. Can’t wait to see you next year! Last night we joined folks from the Conch Tour Train and Keys Energy Services for judging of our annual Holiday Lights Contest. This is one of our favorite events all year. 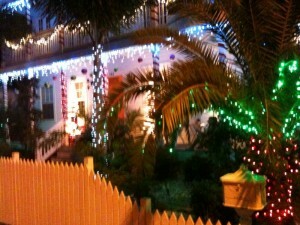 We may not know much about a white Christmas here in Key West, but we sure know how to decorate our houses! This year we had over 20 entries and I would say they all did an awesome job. So without further ado, First Place: Robert and Fran Decker (600 Elizabeth – Corner of Southard St.); Second place Stephern Habberstad (302 Amelia Street) Pictured below; 3rd Place: Stephen Hammond and Johnathon Beyers (909 United Street). Congratulations and Happy Holidays! 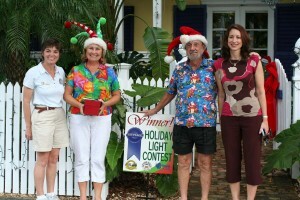 Posted in Key West | Comments Off on And the winners are…..
And here in Saint Augustine no Christmas is complete without our traditional Nights of Lights display. With the flip of a switch, 2 million twinkling white lights burst into life over the Historic District of Saint Augustine on November 21, 2009. This sudden burst of light was the official start of the 2009 Nights of Lights display, now entering its 16th year as a holiday tradition for the city. You are currently browsing the Old Town Trolley Tours Blog blog archives for December, 2009.